Place the beef bones in a large pot filled with enough water to cover. Bring to a boil over high heat. Boil the bones on high heat for 5-10 minutes. The impurities will rise to the top. Then dump out the whole pot and rinse the bones well under running water. Wash the pot clean. This is a very important step to keep the broth clear and it will save your time skimming off the scum later. Place the parboiled and rinsed bones back to a large stock pot and fill with water, about 5 liters. (If you use the same pot, make sure you wash it clean before putting the bones back. It is very crucial for a clear broth). Add 1 peeled onion, 1 tbsp salt and 1 tbsp sugar (preferably rock sugar, but caster/brown sugar is fine, too). Bring to a boil and simmer under medium low heat. Occasionally skim off the scum and the fat. Do not cover the pot, otherwise the broth may lose its clarity. To create the PHO aroma, grill the rest of the onion, ginger slices, star anise, cinnamon sticks and black cardamoms directly on an open flame stove until slightly charred on both sides. You can also use oven for this step. Peel the grilled onion and scrape off the charred part. Try to keep the stem and not let the onion layers fall apart. You can also rinse off the black char bits under warm running water. Wrap the small spices in a large tea/spice bag or a piece of cheese cloth. Drop the bags into the stock pot. Depending on the cut of beef, it might take 1-2 hours to cook. When the meat is cooked, remove and soak in a bowl of cold water for 5 minutes to prevent the beef from drying up or turning dark. Then drain and slice thinly into bite-sized pieces. Also remove the onions from pot because you don't want them to break and make the broth less clear. Continue to simmer the broth for a few more hours if you have time. 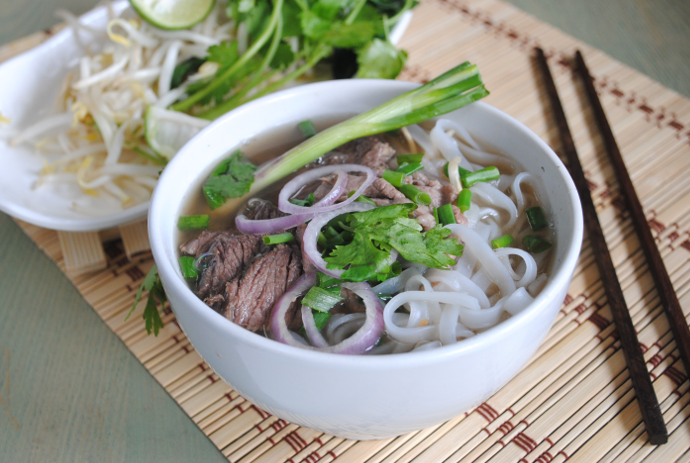 (Traditional PHO can be cooked overnight!) You can add more water if the broth reduces. If you cook the stock for more than 3 hours, add the charred onion and ginger only during the last hour, so that the aroma stays fresh and tempting till serving. Season to your taste with salt, sugar, and stock powder. Soak dried flat rice noodle "banh pho" in water for 30 minutes to soften. Blanch a handful of noodles in a long-handle strainer for 10 to 20 seconds. Drain and transfer the noodles to a serving bowl. Serve immediately. Alternatively you can cook the whole pack of noodles at one go following package instructions. Remove the noodles when they are soft but still a bit chewy (al dente). Then rinse under cold water to stop the cooking process. Then rinse again with hot water to help the noodles dry out faster and prevent clumping. You can also use the same saucepan to blanch the beansprouts for about 30 seconds. To assemble the dish, place a handful of the cooked noodles to occupy one third of the bowl. Place the sliced beef on top (cooked or fresh raw beef of your choice), garnish with the thinly sliced onion and chopped spring onion. Then ladle the hot soup over to full fill the bowl. Serve with a platter of herbs and blanched bean sprouts. To serve, squeeze a lime wedge and add hoisin or Sriracha sauce to your preference. -Beef bones are crucial for a hearty broth. The more bones you use, the tastier the broth becomes. Simmer the broth, uncovered, under low heat. – Adding fish sauce to the broth may lead to a sour after-taste, so preferably let diners decide whether they want to add fish sauce to their individual bowls when serving.